Waldon Adams’ body went numb while the words poured from the physician’s mouth. As he sat aghast on a gurney in the emergency room at the Howard University Hospital, each word uttered by the doctor drove the invisible dagger deeper into his rapidly-beating heart. To him, it just was not fair. While he admitted to routinely using freebase cocaine – cocaine dissolved by heat to be purified before use – for nearly two decades, he adamantly denied ever injecting the drug intravenously. But he said he did have an idea of how he contracted the deadly virus. This was not really happening. Surely, it must be a mistake. The only health obstacles Adams faced up until this point in his life were infrequent bouts with asthma. Now, he listened as a stranger gave him the somber news that would ultimately alter his life. Adams had tested positive for HIV. Adams said he initially wanted to commit suicide to escape the shock and pain caused by the seemingly finality of his 2004 diagnosis. “I was going to get a hotel room, take some pills, drink and die. That was my plan,” he said. A lifelong District resident, Adams grew up in the Riggs Park neighborhood of upper Northeast with two brothers he still remains close with to this day. His father worked for the United States Postal Service and mother as a beautician. Adams said although he hated running as a child because of his asthma, he enjoyed the football games against the other neighborhood children at the Lamont-Riggs Park Boys Club where he usually played running back or wide receiver because of his blazing speed. However, those days were now behind him. The innocence was gone. With his new diagnosis, life as he knew it appeared to be over. 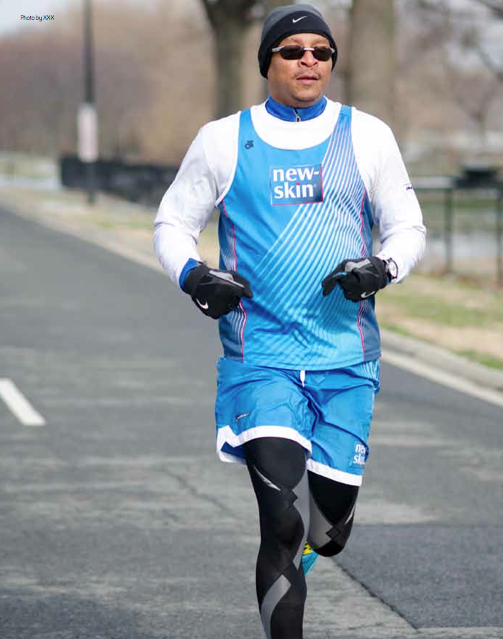 But his inspiration to live came in an unlikely form: running. In January, Adams competed in the Goofy Challenge during the Walt Disney World Marathon Weekend in Florida – his seventh marathon coupled with a half marathon the day before– and intends to run in the Rock ‘n’ Roll U.S.A. Marathon March 16 in Washington, D.C.
That race, then the Sun Trust National Marathon when he ran it in 2010, was his first, and most memorable, marathon. with many of the clinic’s staff members over the years. Several attended the race to show their support. Adams finished the race in 4:48. “When I crossed that finish line, I was in tears,” he said. “A lot of people, after running their first marathon, end up in tears. Adams’ HIV developed into AIDS in 2009, but thanks the new outlook life he discovered by running, the news did not affect him as negatively as did his HIV diagnosis five years prior. His mood and tone, however, turned somber when he began to speak about his own mortality. He talked about the emotional pain he felt after the loss of numerous friends to HIV/AIDS related complications. And although his body remains in good enough physical condition to compete in marathons, he realizes that every morning that he is able to wake up is gift that should not be taken for granted. as a blessing and vows to make the most of his time on earth. And while his humble personality will not allow him to consider himself a role model to many, he does offer some advice to those facing adversity and in need of inspiration.